FOUR kilometres outside of Blackbutt, heading towards Yarraman, a Ned Kelly letterbox stands proud beside a concealed driveway on the edge of the D'Aguilar Highway. The irony is, it can't be used as a letterbox because the post man won't stop to deliver mail there - it's considered too dangerous. And the garbage truck refuses to stop and pick up wheelie bins for the very same reason. 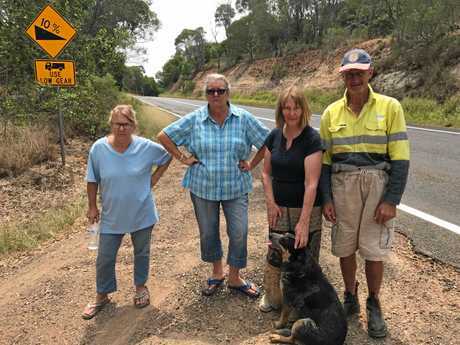 For the past 16 years Jo Hanson, the resident at the end of that Ned Kelly driveway, has been lobbying for safety measures to be put in place so she can enter and exit her driveway safely. Jo said she blesses herself with the sign of the cross before she accelerates out onto the highway. "I wind the window down to listen for cars and trucks, which is OK if the wind is blowing favourably," she said. "I don't head to Yarraman from here. 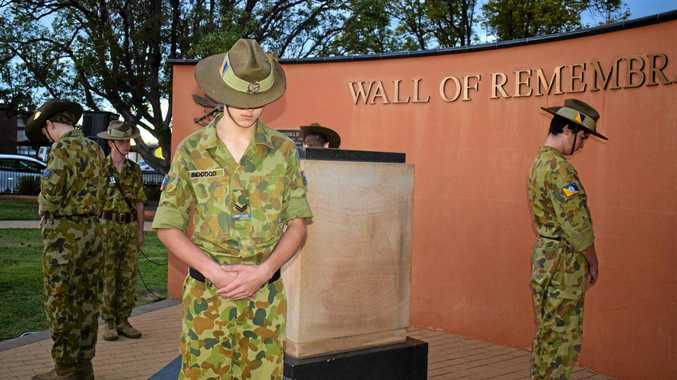 I drive into Blackbutt and turn around where it's safe. "There's no way I can pull out across the highway safely while watching both ways." The visibility from the end of her driveway is, at most, 25 metres in each direction. And Jo needs to pull out into a 100km/h zone in front of traffic heading downhill into Blackbutt. "One of us is going to get killed," she said. "It's not a matter of if, it's when." Jo said Transport and Main Roads installed concealed driveways signs around June last year. "By doing that, they've admitted to there being a problem here," she said. "They tell me they have no money and it was my responsibility to get access to the highway, but that's a load of crap." A Transport and Main Roads spokesperson said the officers had investigated the access last year and decided installing 'concealed driveway' signs would be beneficial. "The signs were installed to provide advanced warnings for highway motorists that vehicles may be turning into the access," they said. The spokesperson said sealing the access would improve traction for motorists entering the highway, but maintaining and upgrading property accesses is a responsibility of property owners. "Motorists should always exercise caution when entering and exiting highways, remembering to give way to through traffic and only proceed when it is safe to do so," they said. Bill and Evelyn Ness Wilson live a little closer to town and are facing the same problem. "The concealed driveway and low gear signs they've got here, they're a waste of time. No one looks at them," Bill said. The Ness Wilsons have lived on their property for about 50 years. "We had to bring our kids to the top of the hill so the school bus would stop to pick them up, and that was 30 years ago," Evelyn said. They remember when the old D'Aguilar Highway ran right past their house, before it was up on top of the hill. "They moved the highway about 40 years ago," Bill said. He believes this is when the problem started. There are remnants of that old highway that Christine Harding, another concerned resident, said could be revitalised and used as a safer on-road to the highway. "They could just continue an entry road up through the scrub where the highway used to be, or go in the opposite direction to come out on top of the hill where you've got more vision," she said. "It can't be too difficult with the machinery they've got. Christine said she doesn't visit her friend Jo any more, because it's too dangerous. "My car has scratches on the front because I ended up in the embankment not that long ago because I got pushed off the highway," she said. Jo said the highway was getting busier and busier each year, but she wasn't looking for a miracle. Just a merging lane, or a safer on-road, or some mirrors to be installed, or simply for someone with the power to do something, to listen to them. "I am like a pitbull, I'm not going to shut up," she said. "It's too dangerous. I don't want to be the one to die, and I don't want any of my friends or family to be the one to die." Nanango member Deb Frecklington said she had asked TMR to undertake a safety audit of Jo's concealed driveway in September 2017. "TMR advised that while 'concealed driveway signs' have been installed, there were no funds to improve access to the driveway, or this stretch of the D'Aguilar at this location," she said. The roads budget around Queensland has been cut by more than $400 million by the Labor Government. "I'll continue to fight for our regions, and I'll continue to fight for funding for our regional road networks," Ms Frecklington said.